A booth display is the key to success at a trade show or a fair. Do you know the musts to be done while designing your display? Here are 7 of them. Every year a tremendous number of companies attend trade shows and fairs around the world with the expectation of getting the most out of these events. What does that “the most” refer to? Well, that may vary according to the company goals. 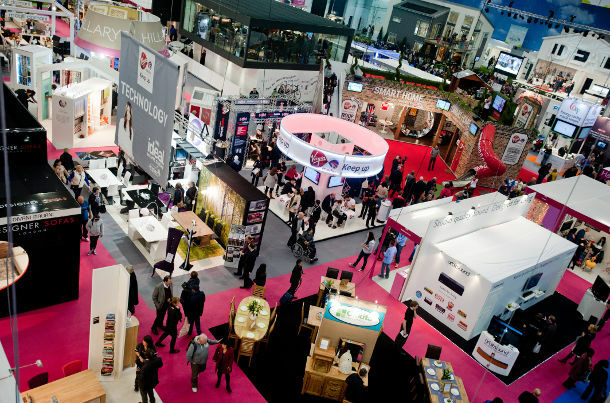 Some companies attend these trade shows and fairs in order to showcase their new products, whereas some attend just to be present in occasion for networking opportunities. There are also a large number of companies that take part in these shows to keep up with the recent happenings in the sector. No matter for what purpose a company decides to attend a trade show or a fair, there are some golden rules for that company to follow in order to guarantee the success they are after. Without doubt, the first rule is about making sure the company space’s or its booth’s being noticed among the crowd. Although this attracting the visitors’ attention is a major case and has already been discussed in many posts here on Eventegg, such as A Good Booth Design: The First Step to be Visible at an Exhibition, How to Get the Most of Your Trade Show Experience and 7 Things that Will Boost Your Exhibition Booth’s Visitor Number, there is one thing this whole story begins with and that is the trade show booth’s display. The display of your trade show or fair booth acts as the face of your company and there are some things you may want to consider to better that face in order to look superb. If you are ready, here we go. What do you do when you are to meet with someone for the very first time? Introduce yourself, right? Do that in your booth’s display too. Make sure your logo is placed in the right dimensions according to the size of your display and your company name in clear fonts, so that the visitors will remember both. Besides, don’t forget to put smaller signs in the exhibition hall that leads to your booth. What people want to know about your company is what you do. Not how good you are at what you are doing, at least at first. This a common mistake done by most of the companies in their display designs. Confusing the visitors with numbers, name of the awards which are definitely unknown to the people and rankings that doesn’t ring a bell in people’s minds. Don’t do that. Let the visitor learn what you are doing first. Don’t attack them with loads of information they are not interested in the first place. Just tell them what your company does or what products your company produces. If it is what they need, they will come to you eventually. And what you can do for them. The attendees that visit the trade show or fair you are going to participate in are need of a product or service, it is for sure. Why not turning their need into your advantage and tell them what you can offer them or the way you can help them with, on first encounter? This is one of the most rewarding tricks you can place on your display. The visitors will know the thing they need is your service and product, this way. Don’t forget; less is more. This one applies to the number of words that are going to be included in your display design. People will not waste their time on reading about the awards your company has won or about your annual sales report which was way successful. Make it short but effective, try to go with smart slogans that will not be easily forgotten. Who you are, what you do, what you can do for them. These three must be included in your display in the shortest but the most striking way possible. You think words are not enough? Why don’t you try some photos? If you think your display is not “cool” enough and will be lost among the others, get help from the photos. However there are two things you should pay attention if you are going to include images on your display. One is that the images must be in high resolution. The visitors will not even consider your company or its service as “serious” if you welcome them with a display filled with blurry photos. The second one is the size of the images you are going to use. Of course, this depends on the size of your display but you have to make sure the image can be seen clearly among the words on your display. Lights may be the best friends of your display when they are used on the right scale. This is not a must, though. One other thing you must consider when designing your display is the lighting that is going to be used in the venue. Is the base of your display will be able to reflect the light? Do you need some extra led lights in order to obstruct the light flow to your display and make it unclear to the visitor? Checking with the venue in advance about the lighting system and the possible restrictions may be a good idea. Spice your display up with the touch of technology. The use of tablets, e-brochures and other ways to use technology during trade shows is a great way to gather the visitors to your booth during the trade show. In addition, in my recently published post 13 Tips on Using Social Media During Trade Shows and Fairs, I have already given some great tips on interactive ways to gather crowds to your booth. You can make use of technology not only in your booth but also your displays, too. Tablets or monitors can now easily be placed on your display and make them look cool, while also enabling you to save some space on your display.